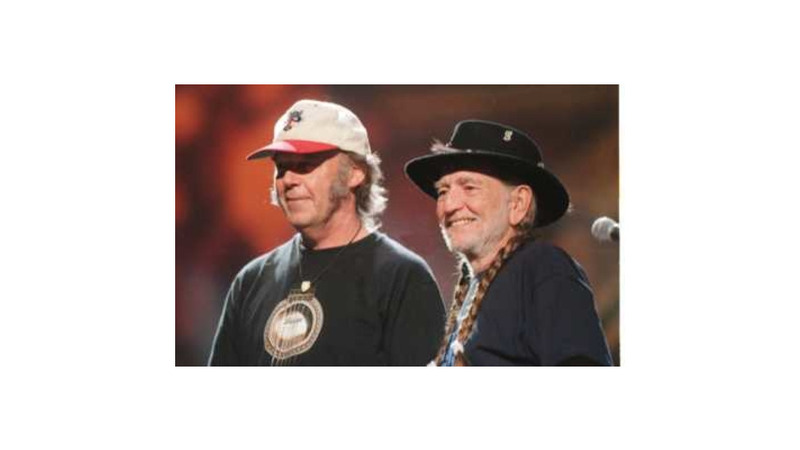 Farm Aid, Willie Nelson's annual fundraiser/music party, rolled through Columbus, Ohio this summer and, as usual, the surrounding circus was as much a part of the show as the musicians themselves. Greenpeace activists passed out flyers. Vendors at makeshift booths sold soymilk and margaritas. Chipotle carnitas were a bargain at $8 apiece, made, the vendor assured us, from corn-fed Ohio pigs who died happy. A cold beer set you back $7, and a red bandana with attached hair braid (instant Willie) could be had for a mere $30. You just can't beat peddling the counterculture. Inside the amphitheater, the 30,000 folks who showed up ranged from college frat boys and sorority girls in tie dyes and designer jeans to graybeards in their sixties. There may have been a farmer or two, but it was hard to tell. From my vantage point on the lawn, about a quarter mile back from the stage, musicians periodically emerged, appearing as tiny insects in the distance. Fortunately, I could hear just fine, and most of what I heard made the day worthwhile. Willie himself opened the proceedings at 2:00 PM by singing the Lord's Prayer a capella. We were then treated to a sacred dance by members of the Lakota Sioux in full tribal regalia, who chanted and waved their arms and stomped about. Then it was time for the music, and there was a lot of music—11 hours worth. The lesser-tier acts followed in quick succession. Erin Brotherton sang a couple of pretty folk tunes and left the stage to utter indifference. Dixie Chicks clones, Trick Pony, covered Willie's "Whiskey River." During a surprisingly effective set, Daniel Lanois was joined by Emmylou Harris. The two performed a scintillating duet on Lanois' "The Maker," which Emmylou covered on her Wrecking Ball album. The set’s highlight was a solo pedal-steel number during which Lanois coaxed otherworldly sounds from his instrument. Although the audience, again, was mostly indifferent, I was thoroughly impressed. Los Lonely Boys, a Hispanic quartet from San Angelo, Texas, performed an energetic set of blues, roots and R&B, sounding a bit like Los Lobos with Stevie Ray Vaughan on guitar. Finally, to close out the afternoon proceedings, Emmylou Harris and Spyboy took the stage and whipped through a half dozen songs, most of them drawn from Harris’ latest album Red Dirt Girl. Buddy Miller's guitar work and harmony vocals were a highlight, and when Emmylou and Buddy locked onto the harmonies in Townes Van Zandt's "Poncho & Lefty," it was a sublime musical moment. You just can't improve on two great voices harmonizing on a great song. Afterwards, we sat in the sun and sizzled for a while. Columbus Mayor Michael Coleman, a farmer in the same way I’m an astronaut, came out and made some perfunctory remarks about farmers being the salt of the earth and the backbone of America. He also reminded us to vote in the upcoming mayoral election. Then we sizzled some more. Eventually, country favorites Brooks & Dunn emerged in red, white and blue, immediately whipping the crowd into a patriotic fervor. Hokey, sentimental songs about Old Glory were accompanied by red, white and blue streamers that shot into the crowd. I decided it was time to head to the concession stand for one of those Ohio-bred Chipotle carnitas. After the forty-five minute wait in line I returned to watch Brooks & Dunn wrap up their set. They were still singing about America, and by now various members of the U.S. armed forces had joined them on stage, twirling guns and snapping off salutes and looking quite dapper. More red, white, and blue streamers shot into the crowd, leaving everyone feeling happy and secure. Then it was on to the heavyweights for the evening sets—the certified hit makers and Rock 'n Roll Hall of Famers. Sheryl Crow performed to an appreciative audience, playing many of her radio-friendly singles as well as covering Nick Lowe's "What's So Funny 'Bout Peace, Love, and Understanding?" and Cat Stevens' "The First Cut is the Deepest" to excellent effect. Dave Matthews then took the stage after a short break, sans band, and performed a 45-minute set. All the boys and girls in the tie dyes and designer jeans were very, very happy. Matthews, in fact, received the most enthusiastic reception of the night, and a sizable portion of the audience departed after his set. After ten years of trying, albeit not that hard, I have yet to really understand what the fuss is all about. What is the thought process to take a human life? What will be the reason to think that this is right? From heaven to Washington From Jesus Christ to Washington. The crowd booed. No red, white and blue streamers cascaded down. Mellencamp performed "Little Pink Houses (Ain't That America?)" and won half the crowd back. But the "ooooh" sound still echoed through the amphitheater, and I don't think it was the farmers imitating their cows. Neil Young and Crazy Horse followed with a 50-minute, four-song set, which means the guitar solos and feedback appeared in abundance. Neil and company performed "Hey Hey, My My," "Down by the River" and "Rockin' in the Free World" to riotous applause, finishing up with "Be the Rain" from his new album Greendale. The Lakota Sioux reappeared, joining Neil on this tune, dancing wildly as he sang lines like "Save the planet for another day," "Be the ocean where it meets the shore," and "be the river as it rolls along." Then it was time for Willie. And Willie was Willie, effortlessly sliding from hit to hit without pause, trademark nasal yelp strong as ever, trademark red bandana and long braid almost visible from where I was sitting. By 12:30 AM, it was over. A tired, sunburned yet smiling crowd departed.